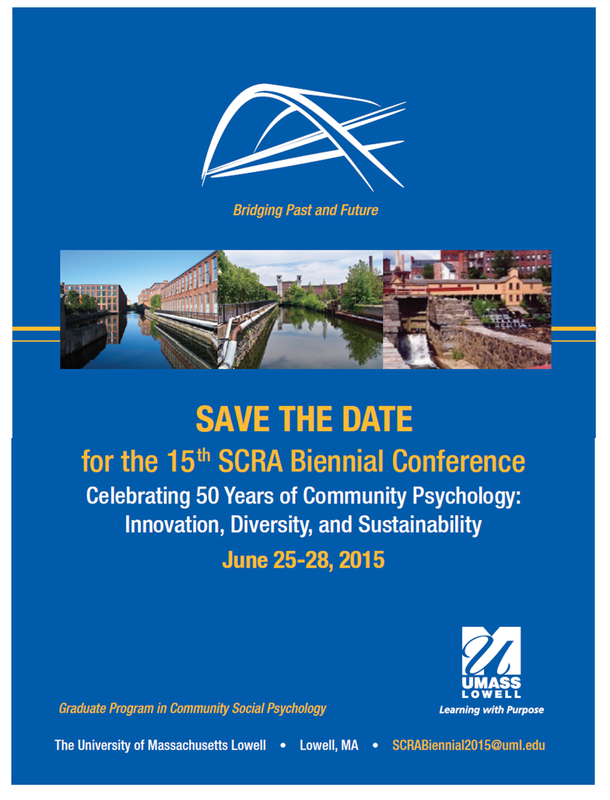 Community Psychology Practice: 2015 SCRA Biennial: Call for Proposals is Now Open! 2015 SCRA Biennial: Call for Proposals is Now Open! Sponsored by the University of Massachusetts Lowell and hosted by its Graduate Program in Community Social Psychology, the 15th Biennial Conference of the Society for Community Research and Action is taking place from June 25 to 28, 2015. The Call for Proposals is now open and closes on Monday December 15, 2014 at 11:55 p.m. EST. The 2015 Biennial will be a landmark event, providing an opportunity to celebrate and reflect on 50 years of community psychology and to commemorate the 1965 gathering in nearby Swampscott. Accordingly, we encourage submissions that document and honor the ways in which community psychologists have advanced individual, family, community, and global well-being and thriving, and/or which consider what community psychologists can and should be doing to help address current and future challenges.